To celebrate the Silver Jubilee of People Park, the residents hire the illustrationist (as opposed to illusionist) Raven to perform. Unfortunately, Raven’s illustrations turn out to be all too real, and the consequences are much more permanent than the residents predicted. 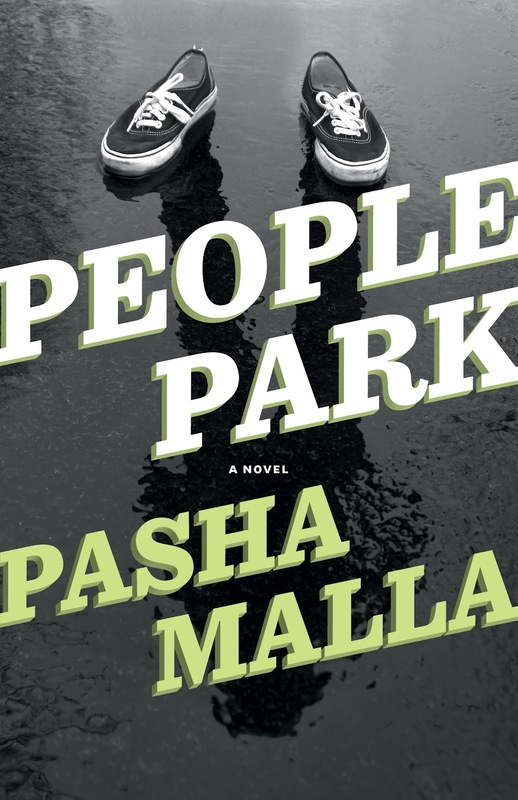 Pasha Malla’s People Park is a very difficult book to get into, and in fact, I almost gave up halfway through. Malla’s book is ambitious, with a dozen or so narrative threads that never really come together. The various character stories do share the common event of Raven’s illustration — the build up, the actual event, and the fall out — but apart from setting, they seem disjointed. There is a two column character list at the beginning of the book, almost enough characters to populate War and Peace, except none of Malla’s characters are distinct enough to make me care. To be fair, the story doesn’t seem to be about individual characters, but rather people in so far as they comprise People Park. We see a jumble of characters, arrogantly complacent and eager for Raven’s performance, then turn to panic when the rug is pulled from under them. There is social commentary here, particularly in a scene where Raven quite literally cuts the Mayor down to size and the residents applaud dumbly. The inefficacy of People Park’s political system and law enforcement agency is masterfully portrayed with biting humour. Malla is at his strongest in the political scenes, where we see how much more horrible things are going to get, with the residents absolutely unaware. While Malla resists allegory, there are certainly parallels to the real world, and Malla’s portrayal is harsh, but the harshness feels necessary. Unfortunately, it’s all just too chaotic. There are too many things being juggled and rather than keep his readers grounded with a single focal point, Malla appears to fling these elements about wildly for his readers to rush around to pick up. The lack of quotation marks definitely didn’t help, particularly when the characters all sound alike. This may be deliberate, a reflection of the chaos already in People Park, whether or not the residents are aware of it. I just found it frustrating. Even when I was able to identify characters, I realized I didn’t really care what happened to them, because they all seemed little more than cogs being moved every which way by Raven’s illustrations. Again, this may be deliberate, but again, it just left me frustrated. I did almost give it up halfway through, but I’m glad I stuck it out because the second half is better. Or perhaps I was just happy that the residents of People Park finally realize Raven is sinister rather than mere entertainment. To be fair, this may also be a case of myself just not being the right reader for this book. Matthew J. Trafford, for example, in the National Post, found it impressive. Definitely not for me, though. This entry was posted in Book Reviews and tagged 50BookPledge2013, Anansi, ARC, Fiction by Jaclyn. Bookmark the permalink.